Science tells us dolls are inanimate objects, but those who care for Robert the Doll and the thousands who visit him each year know better. Lights flicker. Cameras malfunction. Letters of apology arrive on a daily basis. 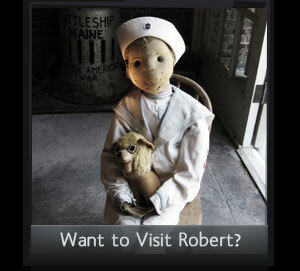 The bizarre circumstances surrounding Robert have earned him a reputation as the most haunted doll in the world. Robert is one-of-a-kind, handmade by the Steiff Company of Germany around the turn of the century. Standing 40 inches tall and stuffed with wood wool known as excelsior, he is dressed in a sailor suit and once bore painted features not unlike those of a jester. His unusual size indicates he may have been fashioned in the image of his constant companion – a boy named Robert Eugene Otto. 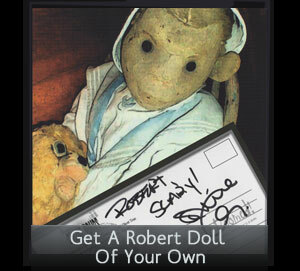 The doll took Robert as his name, while the boy simply went by ‘Gene’. Together they would go on to make history. Take a journey through fascinating story of the infamous Robert the Doll! All images copyright of the Key West Art & Historical Society. Content copyright of the Key West Art & Historical Society and David Sloan.